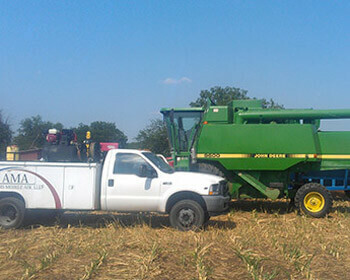 From individual farm tractors to industrial farming equipment, Adams Mobile Air does it all. With the convenience of on-site repairs and installations we save our customers time and money by not having to haul their farm equipment in to an overpriced dealer. Adams Mobile Air services, designs and installs HVAC systems for a complete range of agricultural machinery such as farm tractors, balers, combines, harvesters, tillage equipment, crop dusters, etc. With a focus on prolonged durability and effectiveness, we can service, repair, replace, or install heaters, air conditioners, and ventilation systems to handle the high solar encumbrances, dust, seasonal strain, duty cycles, and workload that agricultural equipment is made for. Whether a client is an original equipment manufacturer or owns vehicles not originally equipped with HVAC, Adams Mobile Air can deliver the value of comfort and productivity to farmers and agricultural contractors. Agricultural equipment models we service include John Deere, Kubota, New Holland, Case International, Caterpillar, Fendt, Hesston, McCormick, Kioti, etc.